It's Tutorial Tuesday and today we are making another Christmas ornament. 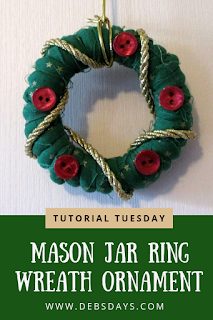 This time it's a wreath from fabric scraps, clothesline cord, and a ring from a Mason jar canning lid. Embellishments like cord, ribbons, buttons, etc.